The Planet Drum office and Peter’s family have received many emails with messages that we wanted to convey on these pages. This blog post will be a place to add these comments. Dear Family of Peter Berg, I knew Peter just a little but I knew he was a brilliant man full of vision. I met Peter at the NABC conferences of the 1980’s. I hope Peter’s work will continue on and that he will always be remembered for his tremendous positive energy and love of life. I am sorry I just learned of his death today. (8/2/13) I am reconnecting to the Continental Bioregional Congress folks. I have only just now heard of Peter’s passing last year. This breaks my heart. You and he were the most generous contributors to my research, and I truly loved having him as a guest in New Hampshire. I was also so glad to connect Planet Drum with Sustainable Harvest. Peter enlightened me to many things, challenged me to think in new ways, and was also a very funny and kind person. We also shared a real foodie’s love of delicacies, and I will never forget how much fun we had eating lobster in my tiny kitchen in New Hampshire and having dinner with you both in San Francisco. Though I still have not completed my book about San Francisco and public space in the 1960s (life has gotten in the way, as it tends to), his spirit and wisdom will surely continue to guide my writing, and for that I will be forever thankful to you both. I have just now learned of Peter’s passing and wanted to send a quick email to say how sorry I am for Judy, the rest of his family, Planet Drum and our planet that is so much better off for his having been here. It makes me sad to think that I will not get to visit him again but will carry fond memories with me. I don’t know if you’ll remember me at all; Peter and I worked together on a conference in San Francisco in the late 70s, when I was living there, entitled “Listening to the Earth.” I just learned, rather late, of his death, and wanted to send my condolences. Peter and I went our separate ways after that conference, but I always admired his dedication, his feistiness. He was, indeed, sui generis. Like Chuck, I never thought that Peter would leave this physical world. He seemed larger than life. I’m saddened by the news, but at the same time I know that his presence will remain with all of us for the rest of our lives. Thank you for opening your hearts to us. Please do let me know if there’s anything I could do for you. Rooted in this place—our precious home. Aimed at creating super kids—Niños Bioregionalista! Rarely looking over his shoulder,. Appreciating each …as we do him. Of the wonder of fully living and sustaining life. In the 1970s I was somewhat lost up in the wild Northwest of British Columbia. There weren’t words or ideas to describe what I had found there…hydrid indigenous/pioneer/back-to-the-land communities, defiantly learning and defending home place. Peter explained what name to put to it. He was gruff and occupied with his own adventures, but he gave me just enough of his time to send me out with new tools, with new fire starter. I’m in Alert Bay off the central BC coast now, deep in the island maze of Kwakwaka’wakw territory…making bioregional maps. Maps that start fires. Thanks always Peter. So nice of you to send me a note as well as the articles and obituaries about Peter; I am sorry you lost your life companion of so many years and hope that you can find solace in friends and fond memories. 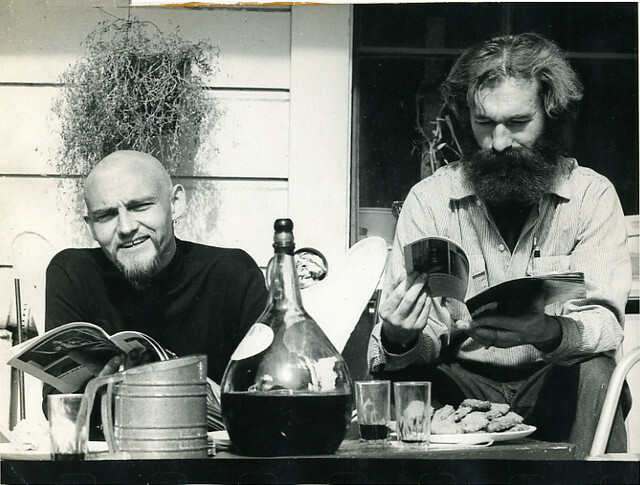 Though I did not spend a lot of time with Peter and left the Bay area in 1968, he was always a great inspiration to me; I awaited Planet Drum for news of intrepid action and wise counsel and was never disappointed. We were all so optimistic that the world could and would be a better place to live, with peace and equality; Peter and the Diggers were a positive force and one that resonated with my dreams; having arrived in the US at the beginning of the 60s, and ignorant of some of the darkest moments of the country’s history, I thought I had found a place for myself in the world and a “tribe” whose values I truly shared. I was studying at Berkeley, my sister was living in the Haight-Ashbury, going to the art academy, we spent time sharing the hopes and visions of a future generation. Many of us have not given up hope thanks in great part to Peter’s thoughtful contributions to living a saner life on a more sustainable planet. It is interesting that last summer, I had a conversation with another moving force, Pete Seeger – we lived in the same area, the Hudson Valley, for several years (he still lives there) – ; like Peter, he has not given up and told me he had never been so optimistic in his life; I was somewhat puzzled and thought he was still hopeful with the election of Obama; he said politics had nothing to do with his enduring optimism, rather, it was the efforts of small local initiatives, like-minded people getting together to make things happen on the basic community level that would eventually save the planet and our sanity. It is in that vein that I always remember Peter, the “we can, we must” motto. I would love to give you hugs and spend some time with you in these difficult times for you and for many of Peter’s friends. Please accept my sympathies and thoughts. I will see many of Peter’s friends on Oct. 1 in Manhattan. Our deep sympathy and condolences to you and Ocean. What a great loss of a unique person, who just seemed too necessary to join ‘the majority’ as Nakagawa Soen Roshi called those who have passed. It did seem like a bolt of lightening. I still feel a bit stunned, like he was ‘beyond’ all that…. Cheryll Glotfelty let me know, as I had written a piece on Peter for the tribute they are publishing. I had been looking at the REINHABITATION OF NORTHERN CALIFORNIA, and admiring again what a wonderful Lizard Man he was. Thank you so much for letting us know about his memorial. Koller and Stefan had let me know the date. Alas we won’t be able to attend, but will raise a toast to him in Oaxaca, where we will be for October. If you are out here in Marin, please drop by in Bolinas if you’d like a walk on the beach or a cup of tea. I will be coming in from New Mexico for the memorial service. My daughter Clane may also be there; she lives in SF. I’m looking forward to seeing many people from way back when. I’m so sorry to hear about Peter. I’ve been out of the bio-loop and only learned about him when I ran into Ron Davis last night. I’ve got Oct. 1 circled and plan to make it to the Randall Jr. Museum. I’ll be happy to bring something edible/drinkable and certainly make a contribution to PD in his honor. Peter was a treasure, and I’ll toast him and his love in the bio-terroir he loved so much in a fine wine. I always thought that his loving appreciation of a good vintage was his nod to the connection between the earth and his love of life. Warm wishes at this sad the for you and Ocean. Very glad to hear from you, but of course saddened by the reason. Peter’s loss affects the culture as well as family and friends. I was interviewed for the LA Times interview for about an hour, it seemed, though they understandably used only two quotes. One was about how Peter was a genius in the sense that pioneers are, and the other was about my “ecology” unawareness which drove me to the dictionary. At my age, and crippled from an old police beating, it’s getting too difficult for me to travel, but I’ll be there in spirit at the memorial/celebration, and I’ve forwarded the invitation to a few friends who knew his work but may not be on your e-mailing list. It was a blessing for Peter that you were there for him for several decades as a companion, wife, co-parent and fellow environmentalist. I am sad to learn of Peter’s passing and will be sadder yet to miss the memorial. Another of the great minds and talents that informed and inspired my youth is gone but never Quietly into the night. I can hear his voice ranting in so many places in my early years as part of a wave of new members in 67/68 at the Mime Troupe. His place in the anti theater alumni, activist environmental thinker doer, challenged anyone to keep up to work harder to think different and to find a way to make it happen. His spirit will be everywhere, traveling inside of the minds and hearts of those who knew him. I am working in Asia, in Taipei finishing a play but in October I will be working in Busan Korea on a new comedy. Sorry to miss the chance to visit with old friends. Please give my love to all. Sorry to be so late getting here, Judy, but you have my deepest condolences. Peter was a giant of a man who made a profound impact on many people, myself included. I cherish his memory. I am figuring out how I can get to the memorial service. Please keep me updated as to location and time. You have been in my heart and mind. I am sending you love, prayers, support, and qi. I was so saddened to hear of Peter’s passing, but, his contributions to all of us are still alive. His visionary and unique insight into the bioregions and our local place continues to make an impact – locally and globally. I got a favorable response from a colleague at De Anza College (Kirsch Center for Environmental studies) on a student scholarship for work in bioregionalism. I will set that up (and fund it) in October and fund one or more students to work on a bioregionalism topic, enough to cover their enrollment expenses for a quarter. I hope to announce that on October 1st. Peter would be happy that they are already discussing bioregionalism in the environmental science curriculum. The concept grows on me more and more. There is an essence of self identity that is embedded in a person’s notion of bioregionalism, the social, political, and environmental setting one chooses to live and work in. “Not small time, not big time, but real time.” It really resonated with me. the hood as time goes on. Some comments which are more in the nature of remembrances of Peter and the work he accomplished in collaboration with those who are offering their recollections have been moved to the “Remembering Peter” posting. My deepest condolences. Peter was a friend, mentor, teacher and inspiration to me for over 45 years and I am still having great trouble accepting and processing his passing. Seeing him in Petrolia was such a gift to all of us. His indomitable and feisty spirit made it seem impossible that anything could take him away from us and it is that spirit that I know will stay with me and continue to guide many of my activities for the rest of my life. I know this is a bit late to be in touch but I have been unable to reach out to you and the girls. I don’t do well with the passing of loved ones and I hope you will accept my apology for this belated note. I want to be able to help you in any way I can with Peter’s Memorial. Me and my truck are both available as and when you need. You and the kids are in my thoughts daily. David and Jane were over for dinner on Sat (I have just returned from Humco) and David and I just couldn’t resist remembering the many hilarious moments that Peter instigated and the subtle humor he used to garnish so much of his life presentation. We all miss him in ways never thought possible. I am grateful for his friendship, leadership and contribution to all of our lives and to the betterment of our planet and it’s beings. Looking forward to seeing you soon and remember to contact me should you have anything I can do. I just read the obit. in the LA Times about Peter. My condolences where they are appropriate. Please put me on any Planet Drum mailing lists that provide information on memorial information and generally, your activities. Thanks and best wishes. Sadness, deep, deep sadness… Peter’s death let me in a deep sadness and melancholy. I’ll never forget his look, I’ll never forget his laugh, I’ll never forget his acuteness,… I’m sure I’ll never forget him. Dear Judy, I send you, and Ocean, my warmest thoughts. I just wanted to say how sorry I was to hear that Peter had crossed over. He was such an inspiration to all of us for so many years–for me, actually, beginning when I interviewed the Diggers (and I believe I met peter but can’t remember too clearly) for my high school underground newspaper when I escaped to the Haight Ashbury for Easter Week in 1967. He was one of the most creative and innovative thinkers in the movement/s, and he will be so missed. Love and blessings to you–we will read Peter’s name at the Spiral Dance. In love may he return again! The more I think about it, the more I realize how formative that meeting with the Diggers was for me. It really set me on the path I’ve followed ever since–and I see so many of their ideas coming back again now. Please excuse me for not being able to answer your phone call. It (Peter’s loss) is extremely sad, but I guess we just have to face it. It is my wish that you inherit Mr. Berg’s wishes and continue the actions. Dear Judy…thank you for your email. My thoughts are with you and Ocean. It will be wonderful to join you to celebrate Peters magnificent life. I have Known by My friend Giuseppe Moretti the bad News about Peter; you don’t know me, but I know you through by studies about Diggers and sixties in San Francisco ( and also about Bioregionalism). Thank you for telling me! You are such a treasure and Ocean did exactly the right thing. Looking at waves a lot is great. In Martin Prechtal’s book–the third one about the revolution in Guatemala, he speaks about the ritual of all the brothers and sisters joining the grieving ones by Lake Atitlan–in your case the Pacific–and crying and singing a lot for the dear one, who is now in the earth and sky, water and wind, and in our hearts and memories. Please allow me to spend a little quality time with you after August 21st. Whatever form supports you best! Love to you, Ocean, Peter in the earth, sky, water, and wind–and all the folks who have been touched by you and Planetdrum! Please keep me updated on any plans for gatherings in his honor. My thoughts and warmest wishes go out to you and Ocean. I’m so sorry to hear about Peter’s passing- it does seem premature. I am sending you love and hoping you are moving through this will all the grace you possess. How sad. He was a great man. We will include a tribute in our next newsletter. Very sorry to hear of Peter’s death. It’s certain that he lives on in the memories of all who knew him. Please don’t forget I’m out here if you need any help I might provide, as I won’t forget you & Ocean & all the good work you’ve all done. Happy to hear you’ll continue your & Peter’s work with the Planet Drum Foundation. And yet, he does live on . . . in everyone and everything that he has touched and that touched him. Too soon for more words. My heartfelt condolences to Judy and Ocean. Would like to send condolences to Judy and others who work on Planet Drum with Peter. Sorry that we didn’t get to interact with him more as he didn’t contribute to Black Bear anthology and our paths went different directions. Peter did great work carrying on Murray Bookchin’s work on biodiversity and sustainability and many praises for his efforts through the years. Thank you all for the work you do. I mourn with you the passing of this great being and celebrate the legacy he leaves and all that will continue to grow from his vision and work. Please let me know if there is a memorial celebration. Peter was a good friend and we will miss him. I came to Ecuador for a short visit. If there is anything I can do for you, let me know. Again, my condolences. He shall be remembered. Deeply sorry for the loss of his family. And good luck to the others at the fundation to keep his work alive. Great to hear from you. We will be there at 8:30AM. And we will definitely do a [tai chi] set in Peter’s honor. What an amazing person he was. I cared for him greatly. Thanks very much for the remembrance of Peter. I enjoyed working with Peter even throughout this most difficult time. I’m going to miss his wit and conversation and the visits with you both. I hope you are persevering. Yes, Peter Berg is still alive in Latin America and in many of us. Here is my blog post on Peter: http://carynmirriamgoldberg.wordpress.com/2011/08/07/in-memory-of-peter-berg-celebration-of-real-time-everyday-magic-day-384/. Wishing all of us clear seeing of our real time together. I told David Wheeler, from Asheville NC, about Peter last night, he didn’t know yet. We remembered him at the Earthaven gathering, Bioregional Congress. Peter died this morning of pneumonia complications from lung cancer. he was only in a hospital a few days, and was weak but normal until the end. haven’t seen maryellen lately. guess i should call her. RIP_Peter Berg he sure had a really interesting sense of Imagination. Heartfelt condolences to all the family and friends of this great person! May his teachings endure and continue to carry us forward.. He was the best friend I ever had. Wish I could tell you all the stories and hear yours. I was very sorry to learn of Peter’s passing, glad to remember his very good works and good times. I’m so very sorry to learn of Peter’s passing away recently from lung cancer. I know this is a huge loss for Planet Drum Foundation, and is very sad news. Peter really made so many contributions to advancing bioregionalism over the years, and I know will be greatly missed in the sustainability community as well as in your organization. We at Cottonwood Foundation also have appreciated working with Peter over the past many years, starting in 1994, and I personally have heard him speak about a decade ago at an International Forum on Globalization event in Washington, DC. That is good to learn that Judy Goldhaft will be taking on the lead role at PDF, and the Clay will be continuing on in Bahia. Still, I realize that this will be a different era for Planet Drum Foundation. Again, my condolences to the whole Planet Drum community on Peter’s passing. It is with great sadness that we write to inform you of the death of Peter Berg, a Fellow in the class of 1998. Peter regularly attended our annual lunches and many of you had a chance to get to know him over the years. The attached obituary from 8/14/11 in the S.F. Chronicle tells some of his remarkable story. He contributed much and he will be greatly missed. My sincere condolences to you and Ocean on Peter’s death. He was a shining light. I want to post to the bioregionalist listserve an appreciation of his influential work at NABCs and TIBCs, and especially at the Green Cities Conference in July 1989 at Loyola U in Chicago. Were you at that conference too? My recollection is that you were, but I don’t see you in the video tape I have of conference workshops. I have a VHS tape of conference keynotes from that remarkable Green City gathering. If Planet Drum doesn’t have a similar record of this, I’d be glad to donate it. On the tape, Peter then chairs a workshop of bioregions’ reports from different cities. Quite unfortunately, the tape goes blank there and all one can do is fast forward and see the rapid images, but no voices, of various workshops, plenary and closing talking circle. I don’t know if technology exists to recover the rest, but Peter’s keynote is easily understood. The tape doesn’t pick up Jimmy Bogg’s keynote so well, but maybe the Boggs Center in Detroit could help, if copies are ever made. Milwaukee Area Greens (MAG) once ran a great pic of Peter and David Haenke addressing a tentful at TIBC 1996 in Tepotzlan. The pic is in the second last issue of the MAG newsletter, (vol. 30, Spring 1997). On a long shot, I will ask the photographer if she still has the original or digital. Somewhere I may have an extra copy of that newsletter to send Planet Drum. I can’t remember who outside of Milwaukee might have been on our mailing list then, but I could certainly photocopy that page. My sincere condolences. I only meet him once with his friend Saul and Michael came along as well. This was last June. I was very touched by this meeting with him as he was most hospitable while having to manage his limited resources as he told us. I was most impressed by his knowledge of the situationist movement in the 60’s and we reminisced about that. May Thy forgiving Glance heal his heart. Lift him from the denseness of the earth. which is his true dwelling place. of Thy most exalted Presence. the glorious vision of Thy Sunshine. I was so sorry to hear of Peter’s death. Even though we didn’t spend a lot of time together, I had great admiration for him, and we loved to talk and joke whenever our paths crossed. He will be sorely missed by the larger community of progressive thinkers and activists, and of course, most deeply missed by you and his other family. I send you my best wishes and love. I am recalling a great West African adage that says, “When death comes may it find you alive.” I don’t doubt that was the case with Peter. I was so so sorry to hear the news about Peter, and I send you my deepest most heartfelt condolences. I always appreciated enormously the obvious depth of your relationship to him, and your love for each other; what a great loss this must be for you, and in fact it’s a great loss for all of us in this community, even those of us who knew him far less well. I can’t say that Peter and I were close friends, and I barely saw him the last few years, but still I always thought of him with the greatest admiration and respect for his genius, his personal power, his wisdom and humour, warmth, directness and courage, for his curmudgeonishness. He did a lot, he spoke the truth, and left his mark; one which we have all benefited from. I hope you are doing okay now, and are getting the support you need. I look forward to seeing you at the memorial service, which I take it will be October 1. Meanwhile, I send you all my best wishes and love and appreciation. It was with a heavy heart that I heard the news. But also lots of love bubbled forward. I feel blessed to have met Peter and to have gotten firsthand experience with his visionary ways, big heart, and deep love of life, especially the natural world. I will miss him. I know his death has left a large hole in your lives and heart. May it be filled with his great memories. – there are actually five, counting the first appearance of the shot of Peter and Me. I see Peter’s smile and the twinkle of his eyes. I remember almost 40 years ago how perplexed seemed his delightfully pithy comments that at first confused me and then, when my mind was duly opened, helped by his can opener of creativity, how simple it was to understand his instant thoughts, ideas, and pronouncements on everything! Like a vacuum, ready to be filled with life-changing materials I was blessed to meet you and Peter. Our times in Montana, in your gardens, the basement, though long ago, are so strong in my memory that I can still smell the smells. Right now, torn between the joy Peter brought to us all and the pain of his loss for you, dear ones, I join in saying that Peter Berg was an immense man, bless him’s heart. sympathies and love to you, dear warrior and Earth lover. I couldn’t help but leave a message even though I did not know Peter through his work nor did I know him for very long. These postings are testament to his great importance for so many people and for our planet. It is refreshing and inspiring to read about him and the work that he did. My first impressions of bioregionalism were greatly affected by Peter and Judy’s evening performance of standup and dance at the first North American Bioregional Congress in 1984. It was not only artful and funny but opened for me a new connection to the natural world. Soon after, I read Peter’s Amble Toward Continent Congress (1976), a ground-breaking piece, which I guess was the inspiration to David Haenke and others to begin organizing bioregional congressess where many of us learned to (in Peter’s words) “transfer loyalty from the state which violates it to the region which requires it.” Thank you, Peter. Love to you, Judy. Heartfelt condolences. I’m glad you and Peter touched my life here on Maui. Thank you for the great work you and Peter have been doing. Our world is a better place because of both of you. I pray for peace and healing for you on all levels. I hope this is appropriate. ho saputo oggi della morte di Peter. Qualche anno fa passo per la città di Ravenna Italy, lasciando il segno della sua mente gioiosa. I learned today of the death of Peter. A few years ago in the city of Ravenna, Italy, he left the mark of his joyful mind . We remember him with affection. I am deeply saddened to learn of this. There is much more to say and never the time, never the place. So inadequate are these words. Peter, you marked me forever, I will never forget, I believe in your work and I will do everything I can to help advance it into the future. I believe in long, long investments of heart and energy in the work of this world. So you have become part of how I work. I wish I had told you, wish I had taken the time. Judy, Ocean, my deepest regrets. There is much more for me to say and do. In time, in the coming months, I will. But I believe and I am ever, ever grateful. I am so, so sorry to hear this news and send heartfelt condolences to you, your daughter, and all of your close ones. The concept of bioregionalism has been pivotal for me in imagining a sane and sustainable future. I was so glad to meet you and Peter at the Dimond Park workshop in Oakland a couple years ago, and while it isn’t much, I feel good about my small monthly contribution to Planet Drum in support of this work that you and Peter have given so much to and that has such profound implications for the future of this planet. I am devastated by this news. Peter called my last month, and we were planning to meet in August for a long-overdue lunch to catch-up. I truly hope his passing was without suffering. There are so many memories from 40 years ago that are now surfacing as real-story truths as family and associates are asking me for detail about our great adventures together – from free print shop days (Jellyroll Press), to Free-Bakery and all the times at Black Bear, and between. My sincerest condolences for the lost of this wonderful man. I met Peter when he taught a workshop at New College – North Bay in 2008. We spoke at length after the workshop, and I so enjoyed our conversation. I was struck by his passion and wisdom, and he encouraged me in my connection to my bioregion, and in my activism. I am very sad that we have lost him, but I am heartened that he has blazed a path, and taught and inspired others to carry on his work. I will carry his inspiration with me and cherish it. My condolences to all of you from myself and Nature in the City. I had no idea that he was ill. Thank you for the remembrances. Peter will be missed indeed. Deep condolences to you at this time, Judy. Pete is a great inspiration. Much love to you at this time. I am so sorry to hear the news of Peter’s departure. I have thought about him since he wrote of his illness in the newsletter. Please accept my condolences. Although Yana and I did not know you well it was a pleasure to have spent even a little time over the one dinner we had together. We were pleased to number you both as friends in the awakening of earth consciousness. Your work together will remain as an important beacon in the shift from the ecological darkness that threatens but that, thanks to Peter and your light, has become measurably less oppressive. Thanks are due for such a determined spirit. Peter’s dedication brought new hope to many, I know. I send my best wishes and prayers for you, and family, and for Peter’s safe journey. Please let me add Yana’s condolences to my own for Peter. We both had such admiration for him. Peter has had a huge impact on my life. 29 years ago he had faith in my contributions. He encouraged my path, and I continue in his spirit. Please accept my deepest sympathy. Peter made a real contribution to the world. Judy, I burst into tears. I am so disappointed with myself to not to have seen him in San Francisco. I will be for the rest of my life. I share the sadness with you and your family. He was part of my family and my heart and soul. He made a significant change in my life, he fortified my yearning for earthly and environmental justice.I will always talk about him, spread his words to everyone. At this moment I am writing a book where I have a chapter on Bioregionalism. It was an Honor for me to have had him as an Hermano. His work will go on in all of us. The news of Peter’s death came as a great shock. Even writing these words, it’s hard to believe that he’s really gone. Somehow, though we met all too rarely over the years, Peter was always there, solid, rugged and dependable, a landmark in the landscape, always there when the mist cleared, a watershed, a landmark; like a mountain dammit! And a beautiful bloke. Peter’s work (and yours) reached me first when I was reading CoEvolution Quarterly back in the 70s and living in Wales. It affected my thinking about cities and ecology in profound ways that have deepened over the years. I can’t imagine, nor see, the world without thinking in terms of bioregions. I can’t conceive of ecocities without a bioregional reference. And I can’t imagine separating the strands of social activism from the idea of ecological action and city-making. He’s got a lot to answer for! My memory of people and places often seems a little muddy, but I remember each meeting with Peter with remarkable clarity, and as special times. Last time I saw you both was at the Ecocity conference in SF in 2008 and catching up with you and Peter, albeit too briefly, was a highlight of the trip for me! I’m going to miss Peter like hell. But you’re right, he’s still with us. For me, he’s woven himself into the very way I see the world. Cherie and I remember well when you both came to stay with us in Adelaide. Nonny, who was just 12 then, is now the mother of three kids and was around the house today, she remembered Peter incredibly well and with great affection. He is an unforgettable presence. I’m writing an ebook on ecocities due to be published (by New Internationalist) in a couple of months or so. I’d like to dedicate the book to his memory, if you think that’s OK. It feels like the least I can do. Judy–My deep condolences to you and Ocean. We’ve lost a good man–more, an important man. I wish you well. I am really sorry to hear of Peter’s passing. He was a giant who inspired many to do their best for the planet and the small piece they could know best. Le mie attività di ecologista e bioregionalista nella mia bioregione non sarebbero state tali senza la conoscenza di Peter e della sua visione ecopacifista. I am saddened to hear of Peter’s passing. I was hoping we would have him with us for a few more years. Maria and I are glad that we got a chance to see him when we visited last year. He was still sharp, still himself, still had that twinkle in his eye. I love the quote from Peter, four days before his death. Both true of the man’s life, and also wonderful advice for how to live, for anyone. We are especially thinking of you, Judy . . . grateful for the great role you played. This year the Pale Lady has been truly busy reaping some of the best souls in the fields of our Pachamama. It is almost scary to open the mail, to read who of our most beloved brothers and sisters has been called to join the other realms, leaving their frail trails in this more and more confused situation our Mother founds herself in our days. This time it is the turn of our dear, dear old brother Peter. Each time I do my presentation of “From Utopia to Ecotopia”, I tell the story of Peter, with some photos from him with the SF Mime Troupe, the diggers, his first visit to México, the bioregionals of the North, and his -I think- last journey here to the Consejo Bioregional of Meztitla in 1996. In that same audiovisual, I tell the people stories of how bioregionalism grew up in the consciousness of all of us, and how important part Peter and you Judy, played in this re-mapping of our lifes and committement to dedicate them to the service of the Mother and all of its children. Peter stands together in my personal Hall of Fame, with some other of the elder northern brothers that most marked my own path, such as Gary Snyder, Murray Bookchim, David Haenke, Steven Gaskin, Caroline Estes, Garrick Beck, Plunker Adams, Fantuzzi, the Marshalls, Starhawk, you Judy, Bea Briggs, Chris Wells, Glen Makepeace, José Arguelles and a few others I don’t need to name in this small memorial for my departed hermano. Maybe all of those who are leaving this plane now, are jusy getting together up somewhere to organize themselves first, and then us, to face the challenges of the coming emblematic year of 2012. We are for sure going to need a lot of support from all the dimensions, and we count on you, Peter, to lead us and prepare the way to continue bioregionalizing the etheric upper world, like you did it in this one. I send my prayers from the South for your journey, and we send all the love, support, strength from our tribes to Judy, Ocean and the Planet Drummers for the continuation of the tasks we are all devoted to. thanks for crossing paths with us… and then walked part of the way with some and many. Know he is with us in our work and equally in our play and perhaps mostly in our relations to each other and the earth. I grew up a bit over strong coffee and talks at the kitchen table before winding back down to the basement laboratory that is/was Planet Drum. He made life provocative, honest, joyful, real to the point of painful at times, deep, outward, inward, backward and forward looking. He always generously share his unique inspiration. I know I join many who will miss him. Please share any plans that might possibly include an old friend and drummer (and first Planet Drum intern ever). Hugs, hugs hugs to Judy and Ocean. we all aspire to be. We were deeply saddened by the news of Peter’s passing. Devin and I enjoyed the opportunity to meet and interact with this thought leader, and his ideas continue to inform our environmental thinking, if not our life philosophy. The world is a much better place from his presence, and we are stronger environmentalists from his life’s work. He is will always be remembered, especially as an influence in Devin’s choice of environmental careers. Please receive our deepest condolences for the unexpected death of Peter. We will always remember him specially the journeys we stayed together in the US, in Mexico and in Catalonia. We will write some words in memory of Peter (and the catalan translation of his writings) in the web site of our catalan green organisation Alternativa Verda. When published we will inform you. I taught for many years at the University of Wisconsin-Green Bay (which was dubbed ECO-U when we first created it in 1967-9), and Peter’s work even inspired me to later create with our students a production titled GAIA/GAEA (which I hope is somewhat self-explanatory as to its intentions). Tho none of you know me, and it’s been a long long while in any event, know that he will be missed by myself and many many others. I am very very sorry. I feel priviliged to have known him. He really ‘made a difference’. to everybody who stand close – if familiar or idealistic – to Peters life my sympathies. I couldn’t meet him in his life time but his ideas and action impressed me a lot. I wish that his ideas will last for long time and that people will continue his work. I will try my best to do as well and have the conviction that Planet Drum will stay and grow from the support of the many people who have crossed Peters ways. Thank you Peter – never forgotten. It is with great sadness that Fred and I got the news of Peter’s death. The work that Peter, Judy, and everyone connected to Planet Drum has done has been a very important influence on our work here in New Haven. You are in our thoughts and meditations. Judy!!!! So stunned to receive the news of Peter reassignment off-planet! To lose such a bodhisattvatudinous dude! Of course the Cosmos must need him desperately elsewhere, the only way I can make sense of this. My Judy mentioned that Peter had said something to her about some sort of health issue at your Odd Monday evening with us, but whatever it was did not sound as serious as it obviously turned out to be. Praise the world to the angel: leave the unsayable aside. Your exalted feelings do not move him. In the universe, where he feels feelings, you are a beginner. shaped from generation to generation, shaped by hand and eye. or beside the potter on the Nile. while the violin, blessing it, fades. understand that we praise them. to save them – us, the most transient of all. into – oh, endlessly – into us. Ramon: As the law of conservation of energy teaches us, nothing is ever lost, but just transformed. Still we yearn for the presence of the beloved as he/she manifested in our lives, although knowing all the time it was just a momentary shell enclosing the sun for an instant. Dear Judy and all at Planet Drum. I am shocked and saddened at hearing about Peter’s passing. My most humble and sincere condolences. After twenty years of friendship, I feel as if the oldest tree in the forest has fallen. Will there be a memorial planned? Please let me know if so, and Marianne and I will be honored to attend. ” A man may die, nations may rise and fall, but an idea lives on. Jim and I were deeply saddened to hear of Peter’s passing. We both had great affection for him as a person and respect for his and your work. Please let us know if we can be of any help with anything. If there is a memorial event, we will try to attend, and in any event we hope to be able to see you soon. Just now I learnt that Peter Berg passed away on the 28th of July. My hearty condolences to you and Ocean. I have fresh memories of meeting you and Peter in your home in San Francisco with my friend Abraham Vasant. I was really fortunate to have met Peter and shared some quality time with him. When I knocked at your door, Peter opened it and identified me as the teacher of two students (Aleena and Susan) who were corresponding with him. One of the two students, Aleena (whose Ph.D. thesis is on “A Bioregional Reading of Select Plays of Jack Davis”) has submitted her dissertation and awaits the award. She will be very sad to hear the passing away of Peter. I wish to convey to you that all of us in India who have known Peter personally and through his writings share your grief at this moment of unbearable loss. learning that peter passed away made me very sad! we only met a few times, of course — but being with the two of you was in a strange, good way very familiar to me. what an unusual (and great!) combination of heart, severe intelligence, tenderness and humour he had! I’ll never forget him, I know that — nor the great time we had when we visited you in your house. I wish we will meet again judy — and I am sending you my very best wishes across the ocean — also from pio! I only just now heard about Peter’s passing. I wanted to write and offer my condolences. I had heard Peter was ill but this news comes as a sudden shock to me. I am glad that I had the opportunity to meet Peter on several occasions and share in his enthusiasm and evident zest for life. His work with the Diggers and Planet Drum will always be an inspiration to me and my own work. PS I will be out in SF in September and October. Will there be a memorial or public event for Peter any time soon? It’s a real task to, in any number of words, cover the vast and deep econoospheric life region that was — and is — Peter Berg. A book or 2 could, and may well be, written just on the subject of his seminal role in the development of the 60’s counterculture, and his great talents as an activist performer and social innovator, as with the Diggers, where he and his wild crew of coyotes, more than one a Peter, characteristically went for the radix elemental of freedoms: personal, political, economic: free everything dispensed as performance piece of great and funny seriousness, real stuff dispensed for the benefit of living beings. When and where the ecological thunderbolt hit him I don’t know, or maybe it was there all along, but his relentless primal drive powered by his mind nonpareil to the live foundations of palpable truths sent him into the — mostly untrammeled by humans of neo-european origins or those associated by appurtenances of “modern” “civilization” — realm of the pioneers of functional ecocentrism. Here he discerned and divined the numinous vajra of how and indeed why the Earth physically delineates its body ecosphere, the bioregions, and how, from right out of the nature of bioregions, comes a new and ancient way of life for our species, of a whole cloth, all-encompassing, depthless, specific, palpable truth pervasive, something way beyond theory but, and necessarily so, applicable and capable of being implemented in all the appurtenances of ecological design: reinhabitation and its greenprints. The bioregional revelation can, and has from my own experience, fully and ecstatically possess mind body soul, and I believe it did for Peter from the first transmission of who knows when to his last breath. I believe his divination of bioregionalism’s ecstatic nature played fully into his original passion and performance of the arts of freedom and gave it vibrant ground and source. To me he abides on a very short list of the original ecocentrics who, some passed and some still with us, translated not just the idea but the ecological decentralist roadmap to implementation of a way for the humans to stay here on the planet, and taught it brilliantly through all manner of performance, on stage, lectern, written word, and pulling up the concrete on the streets of San Francisco to plant native trees and the seeds of green cities. It was of the greatest of honors to have worked with him in the bioregional movement, though it was not at times easy, and why should it have been? Peter was indeed a force of nature. With all that implies. Just like his bioregional vision. One of Turtle Island’s Holy Coyotes. Goodbye Peter, and thank you beyond all measure for what you did and what you left with us. I am so saddened at the news of Peter’s death. He will surely be missed, and I don’t believe there will ever be another man like him. Irreverent, devoted, loving, eclectic, passionate…those are just the first adjectives to pop into my mind. Our family is growing smaller by the year, and simultaneously my love for those that remain grows even larger. Judy, I just got a phone call telling me that Peter died yesterday. I want to send you my condolences, and to ask if there is anything I can do to support you at this time. I have held Peter in the highest regard for the 35 years that I was fortunate to have known him. He has been an inspiration, and will continue to be one, and I will miss him. Sending love to you and Ocean. I must say that I’m deeply sorry and can’t stop tears from running but I have to say that it was such a wonderful privilege to have been with Peter during his last days. It is now one of my precious lifetime moments. Judy, I hope you can find peace with time and rest from the very heavy job you have been doing. Thank you so much for bearing with Mr. Berg! Ocean, you have a great Dad and I also hope your sorrow eases. It was a pleasure meeting you finally!! Please consider Elsa, Emilia and me your Mexican friends and family, who would love to see you and your family -Mom included- in Oaxaca in the future- be it in the mountains or in the coast. PS Where will Peter be? Did you have a ceremony? Will there be one? This is from Elena Di Cristo, a long time member of our bioregional circle. She says that she haven’t met Peter but that her interest on bioregionalism started reading his articles. per aver fatto girare la notizia. Non lo ho conosciuto di persona ma i miei primi interessi sul bioregionalismo li devo anche alle letture di qualche suo articolo. Claire forwarded me Ocean’s note about Peter’s passing. I have been still and reflective all day, washed over by a sense of drifting, light-headed, feeling so immensely sad. It was a privilege to be with you and Peter and Ocean for those precious days in early summer. I will always treasure those last hours talking to Peter and feeling his spirit and his love. These are some lines about transcendence and silence from Sara Maitland that I wanted to share with you. I am so sorry to hear the loss. I really hope that you and Ocean are doing okay. I am always with you guys, Peter’s wish and PDF. Since yesterday, I have been trying to digest what happened and the meaning of my relationship with Peter. While I need more time to articulate it, it is very clear that I was taught by him on so many things. I loved him, and I miss him, seriously. I have to confess that taking you guys to a beautiful Onsen lodge in Japan has been Izumi and my hope. We wanted to do this not only because of our appreciation but also our pure interest in sharing the experience and conversation with you. I am sorry that we cannot realize it. I notified a circle of Peter’s and my friends in Japan of his death. His contribution to the Japanese environmental movement is tremendous, and I will soon let you know it somehow. I hope it is okay for me to call you after you come back from Mexico. With warm love from Izumi, Noriko, Aiko, and a new one in Izumi’s belly. So hard to come up with words to explain feelings. I’m just so terribly sorry to hear this news. I was sure Peter would fight his cancer, just sure of it, so the news of his passing was indeed a surprise. Our journey continues, now just the three of us. But Cheryll and I, like you, are more determined than ever to continue what we started and to finish it to the very end. Someday, Judy, we will all be speaking at bookstores and conferences about this book, committed to get Peter’s ideas out there in the world. I hope you have/had a good time with Ocean in Mexico. I’m sure you will be memorializing Peter in many ways while you’re there. The sea and sand of Mexico will welcome your love of Peter. When you return, we’ll set a new date to come to SF. And if there’s a time when you want to get away, come to Tahoe. We have a wonderful home on an acre with a very cozy guest bedroom. Lots of love Judy, a big hug sent your way. I would like to take this opportunity to offer my sincere condolences to you and your family, having just been informed of Peter’s passing. I am both sad and happy. I am sad that Peter left us in these challenging times as the world goes through both the “Great Turning” as Joanna Macy calls it, towards a more sustainable future and at the same time, “The Great Unraveling” that David Korten calls so exemplified by the poisonous politics going on in our own nation’s capitol. Peter’s vision of looking at and working on a bioregional level has deeply inspired me in my own work. I am also happy at the opportunity of spending the time with you and Peter at your home and despite all of the pain and suffering that he was going through, for being such wonderful hosts, I came away inspired to continue my work in Ecuador. I recently had the opportunity to meet Clay and visit briefly Planet Drum’s nursery in Bahia. I think Peter’s vision and its implementation are in good hands! Judy, a welling up of sadness overcame me upon reading your beautiful and meaningful obituary for Peter. Loved ones who are gone are everywhere in nature, as you expressed so perfectly. You will find, that they are right on your shoulder, when you need them. Si tenes contacto con la familia pues hacele llegar mis condolencias. Estoy unos dias en Cordoba pero cuando regrese a BA hare un tributo recordatorio sobre Peter Berg en mi blog. If you have contact with the family please send them my condolences. I’m a few days in Cordoba but when I return to Buenos Aires I will make a tribute to Peter Berg on my blog. Over the years we’ve also lost some beacons who saw the way we are headed and made herculean efforts to shine their beams towards realistic, alternative routes of escape. Here we are thinking of Bob Swann, Scott and Helen Nearing, R. Buckminster Fuller, Barry Commoner, and most recently, Peter Berg, who passed away this past week. 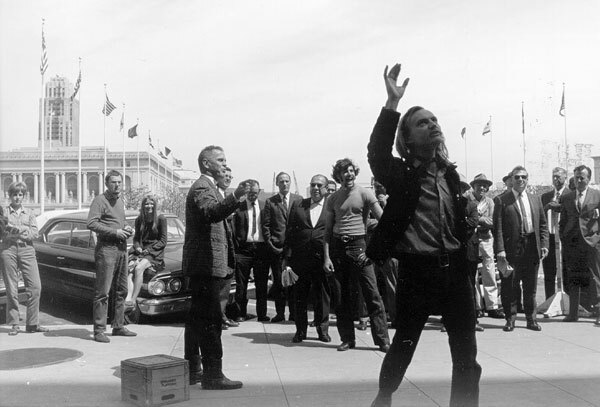 Peter Berg was a San Francisco beatnik who was fond of turtleneck sweaters and free public art. He became one of the architects of the cultural revolution of the 1960s and later coined the word, “bioregionalism” to describe the only possible non-catastrophic way forward. Peter is still alive in Latin America! Peter Berg, a social hero with green wings… our dear friend and teacher has departed yet is still flourishing in our inspiration and bioregional practices all through Latin America. Peter was amongst the first bioregional pioneers to come to Mexico and speak to us about bioregionalism and Green Cities… this act shifted the course of our lives and re-directed us towards roads which we have since been traveling and developing collectively. Peter, along with Judy his wife, have been working for the Bioregional movement in San Francisco yet also planting seeds for a better world in the fertile lands of the south. His later years were dedicated to a great project in the Bay of Caráquez in Ecuador and in the 90’s Peter had great solidarity with the people of Tepoztlán in their struggle for Autonomy and stopping the construction of a Golf Club in their ancient village. Peter participated directly with the people in the community’s assemblies and public gatherings. His participation and the support of the international Bioregional movement were key factors in averting this social and environmental disaster. Peter’s inspiration continues to flow in the veins of our new generations. With practices developed by Peter, thousands of people have been trained in bioregionalism through the networks of the Vision Councils Earth Guardians. At this very moment we are carrying out the ECO-BARRIOS program in Coyoacan, Mexico City and it is Peter’s ideas that permeate our academic curriculum. Peter you continue to be very much alive in Latin America! The bioregional idea in Italy started thanks to AAM Terra Nuova group around 1985. In 1992 the testimony stick passed to Lato Selvatico, but it was in 1994 that the Italian bioregional movement had the decisive push thanks to the coming of Peter Berg and Judy Goldhaft. We all together walked the Italian watersheds doing presentation, art performances and interviews. Mantova (Green University), Ravenna (where Peter homaged the tomb of Dante), Rome (University “La Sapienza” – and a moved visit to Giordano Bruno statue in Campo dei Fiori), Napoli (where Peter and Judy… and me also, were very much impressed by how ‘wild’ a city can be, but, as a San Franciscan journalist, in another context, wrote “it works!”), Firenze (at the environmental Expo “Terra Futura”). The Italian media and mainstream environmentalists of coarse didn’t understand him (maybe for fear of his cosmic energy?) and did stamp him as “a provoker” (La Nuova Ecologia journal), but for us his words and bioregional models were ‘music’ that nourished our mind and spirit and two years later the Rete Bioregionale Italiana was set up. He came again some time later to speak at Milano’s Radio Popolare and at the Architectural University of Pisa. In 2003 he and Judy came as Guard Fox Watch to confront the Turin’s Olympic Committee on behalf of the western slopes of the Po river watershed. He fought like a real warrior For the Earth! On our way back from the inspection of the Olympic sites on the Sestriere mountain a fox appeared, standing still by the side of the road, looking at us. We stopped and got the message. Peter stayed in contact with us through all these years, exchanging comments, advices, reports… we did the same with him including the recent turmoil in the Rete Bioregionale that forces us to found a new bioregional group: Sentiero Bioregionale. Guiseppe, I have heard so much about your work over the years from Peter and Judy. Thanks for these details, fresh and stimulating, filling in the blanks. I was saddened to read today of the passing of Peter Berg. On behalf of the Children of Ecuador organization, please pass on our best wishes to his family and everyone associated with Planet Drum. We look forward to continuing our work with you to ensure the legacy Peter has left will carry on. I have been thinking of Peter a lot lately and in fact, yesterday morning, I thought of calling to see how he was faring with his illness and the healing of it. I planned to do so soon. Maybe I was sensing his change. I’ve been sending him green healing energy in my daily meditation ever since I knew of his cancer. He was a great thinker and doer and a great wordsmith, very pure in his dedication to this very needy Earth. Editing the book of his writings was rewarding and inspiring to me (which is why I advised him to publish it). The first time I saw/heard Peter and you, at a long-ago OACC, was quite eye-opening to me. I think I loved the way you both integrated creativity and poetry of language with the practicalities of the message. Even this announcement was beautifully conceived and worded – and so true. I have just now heard of Peter’s passing, from David Levine and Paul Ryan. I am saddened by it, that the world is a poorer place without him, yet eternally endowed with his limitless generosity that spread itself everywhere he went. So glad I knew him as I did, and was able to spend many times with him — always rich. As I think back on our times together, I can feel him, and hear his unique dancing voice. Gentle, rolling into laughter easily, and when serious, quiet. My, my, Peter Berg was a great talker, a great listener, a great presence. Thank you for being you, Peter. All of us in Italy in the Bioregional Movement are so sad to hear that Peter has left us; he was and is and will always be a big inspiration for us.